Inklewriter is a great free tool to use with students to write interactive stories. It provides a distraction-free and innovative environment where students can actively engage with their creative writing. 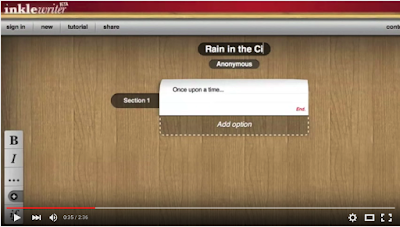 Inklewriter allows students to branch their story with choices and then link them back again. It monitors every step in students writing process, what parts they have finished and which still need to be written. 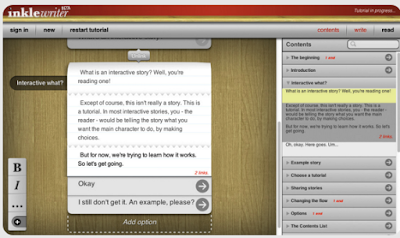 Interactive stories created in Inklewriter can be easily published on the web or social media platforms giving student writers access to a wider readership. There is even the option to convert and export created stories to Kindle. Inklewriter is web-based and does not require any software installation. Students can work locally on stories, but to save their work, and return to it later, they'll need to register an account. The sign-up asks for an email address and a password. For students who don’t have emails, just give each student a unique name (including the school name), and enter that "@inklewriter". Then give them a password, so that if they forget it, you can remind them.